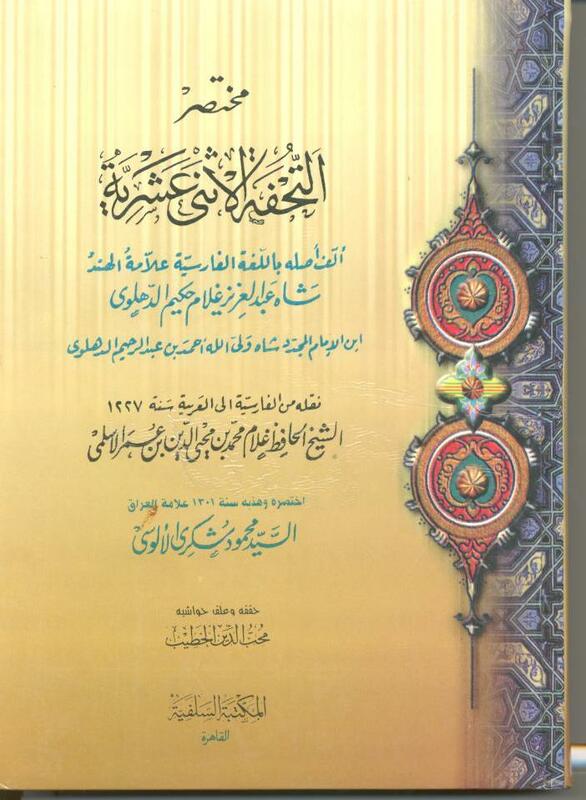 Attached is Shah ‘Abd al-‘Aziz’s famous polemical treatise on the Twelver Shi’as and their doctrine, translated from Farsi into Arabic and then abridged by Shaykh Ghulam Ahmad al-Aslami. This book is a must-read for anyone interested in the Sunni-Shi’a doctrinal debate and the critique offered by traditional Sunni scholarship. This book comes to us courtesy of Sidi Kakazai. I was wondering if there are good books in English that thoroughly explain and refute their, 12er shi’i, claims. Now a days, many Shi’i and Ibadi Muslims under the guise of Amman Message and Azhar’s Dubious fatwa on the acceptance of the Jafari Madhab (12er shi’i) are hoodwinking many lay Muslims in the community into accepting their views. Not to mention, there is absolutely no attention paid to this phenomenon, rather Major Scholars are standing on convention podiums and are preaching unity and so forth, which further confuses general Muslims into a false sense of security. I personally heard a Sunni friend of mine say Uthman wasn’t rightly guided, which echos the theological beliefs of the Iba’adis. Would you believe it, my guess was correct his fiance was an Omani. In fact a convert friend of mine believes the Quran is created, he is also influenced by the Ibadis, and there are examples of shi’i influences that I won’t get into. I mean an article here and there isn’t enough, when the shi’i have whole scale websites that are constantly spewing out propaganda in a very concise and lucid manner. Utilizing texts from sunni sources and construing their meaning that are sure to fool any lay Muslim not grounded in the evolution of shi’i dogmas. I pray and hope in light of this comment the At-tahawi team directs some of their attention towards posting download links on well written scholarly works on shi’i theology and their fallacies, so that we lay Muslims can defend ourselves from such illogical dogmas. This is a site which refutes Shi`a polemics against the Ahl as-Sunnah. It is run by some students of knowledge who study at various Darul Uloom’s.